This Salsa Verde Recipe takes less than 15 minutes to make, tastes way better than your favorite restaurant or jar and elevates everything it touches! 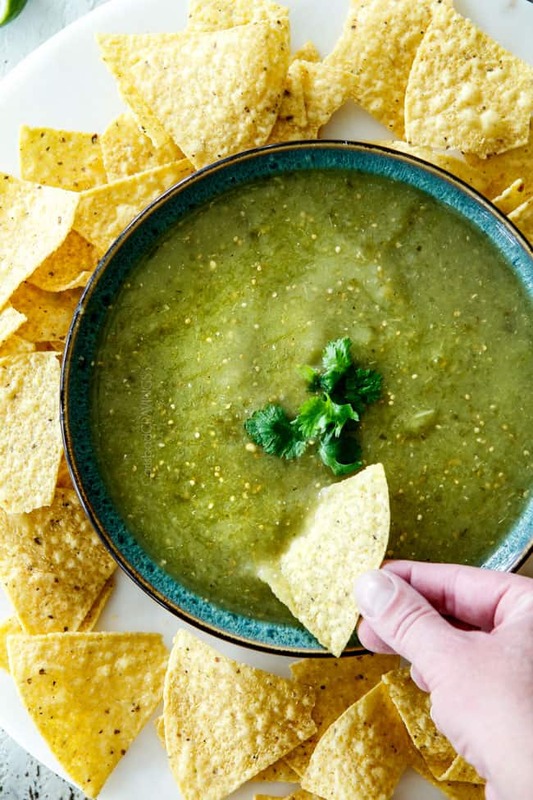 This Authentic Salsa Verde Recipe is going to leave you never wanting to buy salsa again! 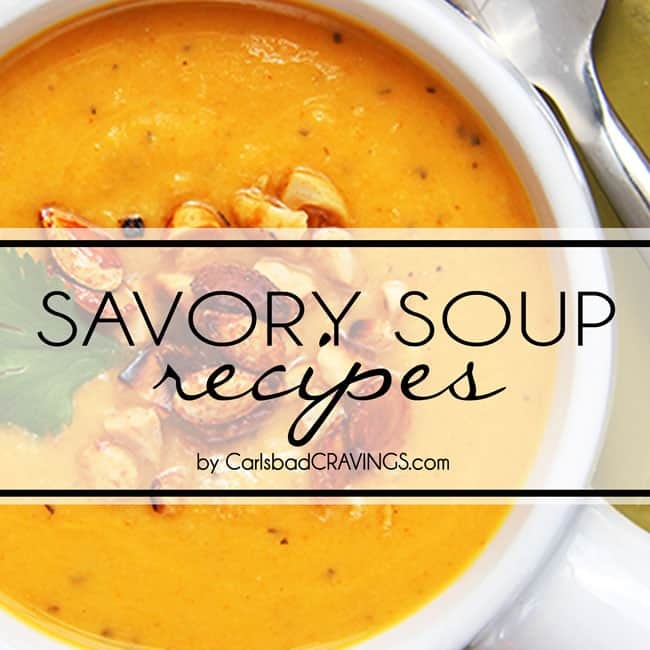 It’s quick, easy, healthy, saves beautifully and you can customize the heat and consistency. 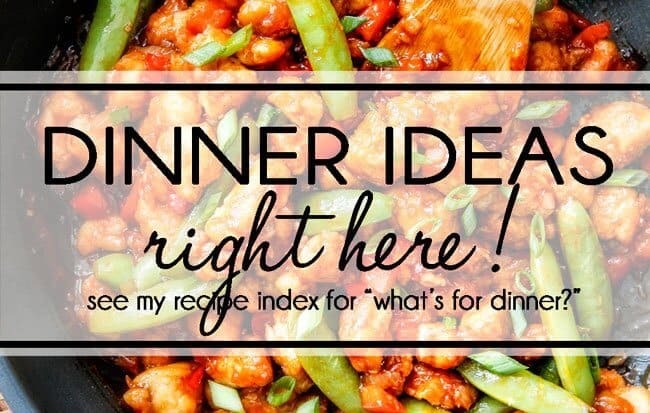 It makes everything better from tacos, to burritos to enchiladas to soups, dressings and even pastas! This roasted salsa verde also makes a fabulous marinade (recipe coming soon). 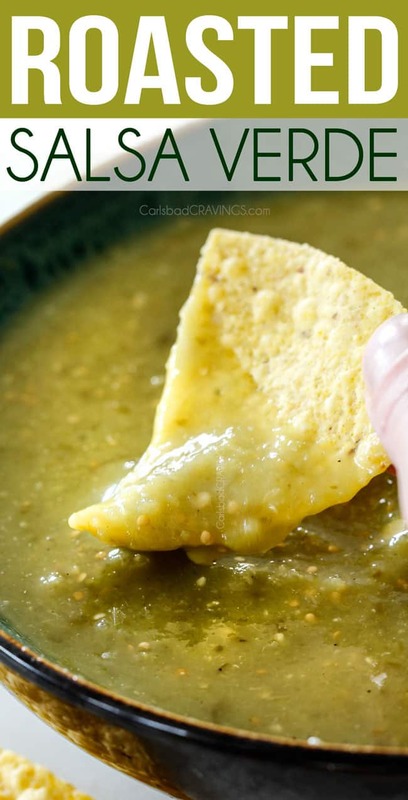 You will LOVE having this homemade salsa verde on hand! 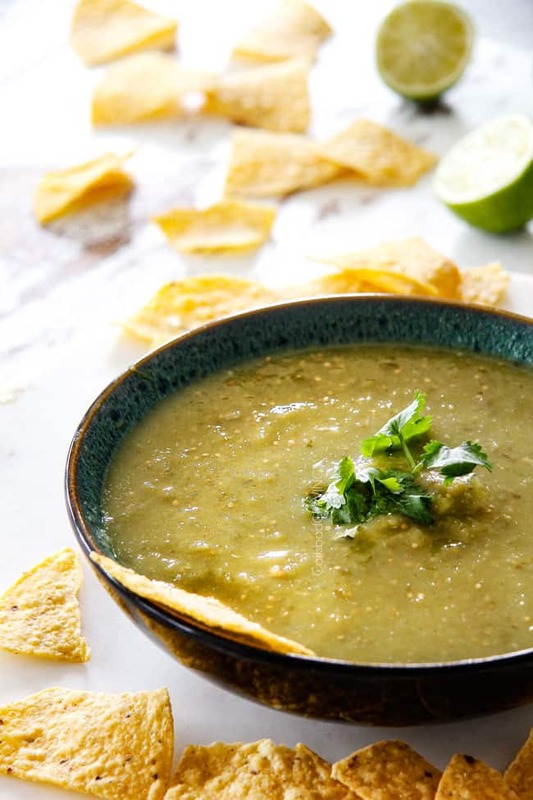 There is a reason salsa verde is a staple in Mexican cuisine – it infuses everything it touches with a deliciously fresh, tangy, bright and as spicy-as-you-want-it-pop. 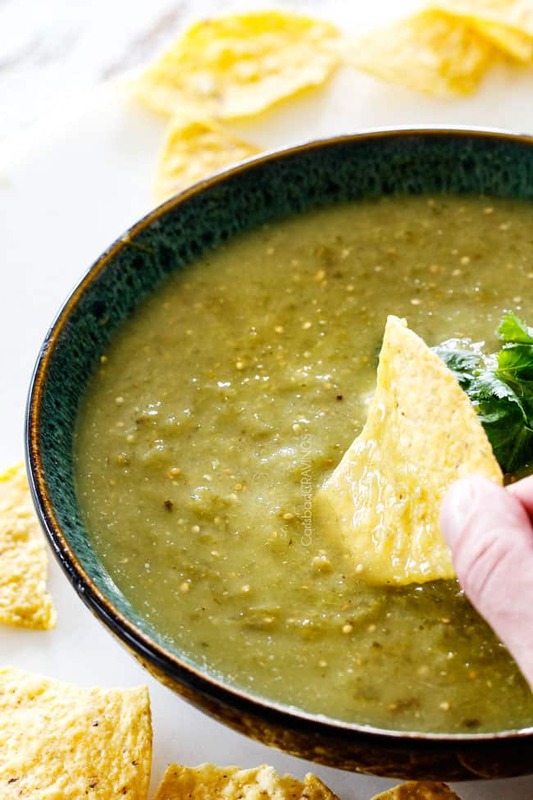 Once you try this homemade salsa verde recipe, you won’t want to live without it – and there is no reason to because it takes minutes to make with easy to find ingredients! What are you going to try it on first??? 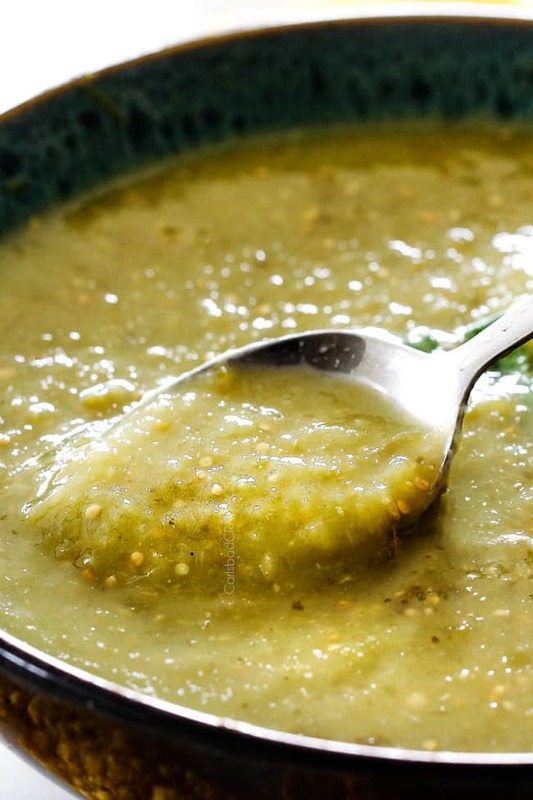 Is tomatillo sauce and salsa verde the same? Yes! Salsa verde, “green salsa” is based on the tomatillo. Tomatillos are mildly tart and citrusy and offer a dynamic punch of bright, tanginess to everything they grace, including salsa verde. If you aren’t familiar with tomatillos, they should easily be found at every grocery store tucked away somewhere in the produce section. Chances are, you’ve passed them every time you’ve been there and never even noticed! Tomatillos means, “little tomato” in Spanish and are known as the Mexican husk tomatoes but are not technically tomatoes and more closely related to the gooseberry. They look like green, unripe tomatoes with a dry, leafy green husk. Once you peel off the husk, the tomatillo is a bright green which puts the green in salsa verde. 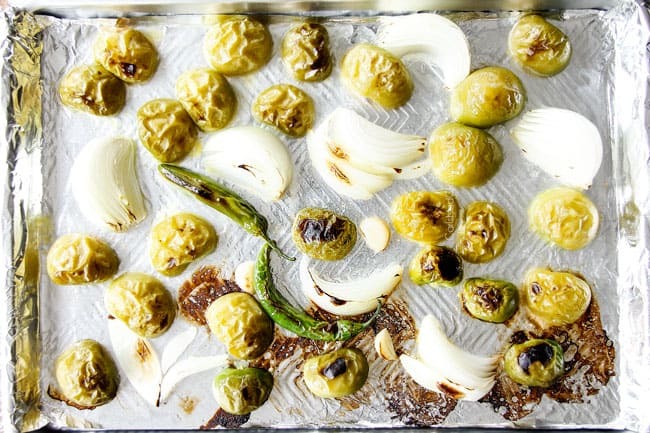 You can leave your tomatillos, peppers, onions and garlic raw, or you can give them a quick 5-7 minute broil in the oven. I have tried salsa verde both ways and although both methods are used, raw salsa verde was far too acidic for my taste and borderline sour. Roasting the tomatillos mellows their bitterness/acidity by developing their natural sugars while at the same time concentrating their flavors leaving you with a rich, complex, slightly smoky tasting salsa – PLUS roasting only takes 5-7 minutes! The payout far exceeds the easy method leaving with you with the best homemade salsa verde around! What is the difference between salsa and salsa verde? While the base of salsa verde is the tomatillo, the base of traditional salsa is the tomato. Salsa verde is far more tart than salsa due to the acidity in the tomatillos. 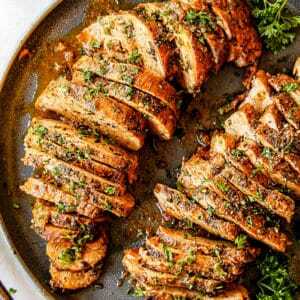 For this reason, I love pairing it with honey like in my Slow Cooker Salsa Verde Honey Lime Chicken and many more recipes (see below). Both salsas usually include serrano or jalapeño peppers, onion, garlic and cilantro. Both salsas are usually made in the blender. Nothing will transform your Mexican cuisine more than having both salsa verde and red salsa at your fingertips. So if you’re still looking for a dynamite salsa recipe, you will LOVE my Homemade Salsa Recipe. And if you’re still looking for a dynamite salsa verde recipe, you’ve come to the right place! Let’s get to it! Husk and rinse tomatillos. The delicate paper husk is very easy to peel off of your tomatillos. Once husked, you notice the surface of the tomatillos is sticky. This stickiness is actually a natural deterrent against insects caused by a chemical compound that insects find bad tasting. (Another reason tomatillos are amazing). This film comes off very easily with just a rinse of warm water. Prep veggies to roast. 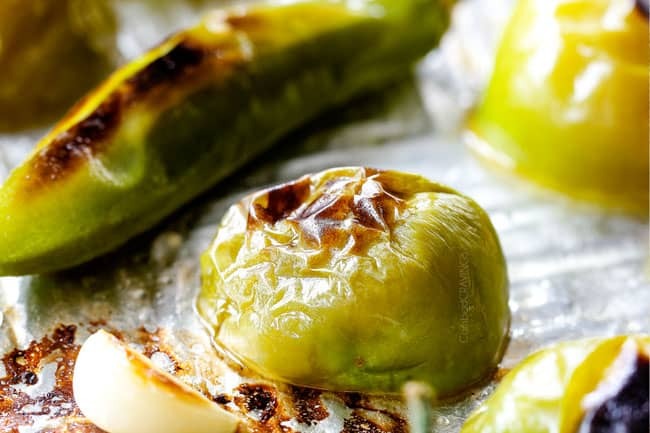 Roasting the tomatillos mellows the acidity and develops a deeper, richer, smokier flavor among all the veggies. 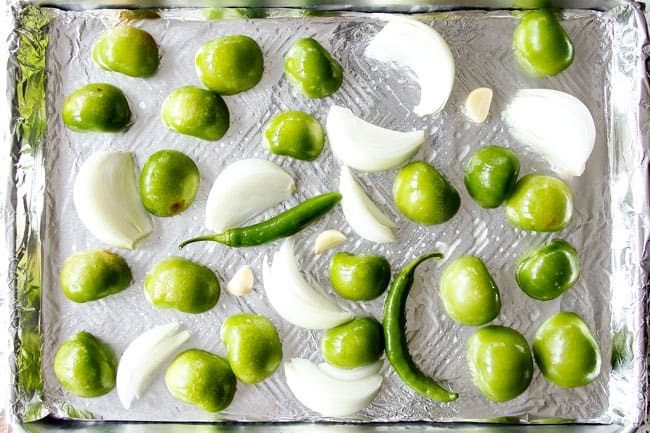 To prep, cut the tomatillos in half and add to a foil lined baking sheet along with onions, garlic and peppers. Drizzle with 1 tablespoon olive oil and toss to coat. Place the tomatillos cut side down. Broil 5-7 minutes. We want our tomatillos to be charred in some spots for fabulous smoky flavor. 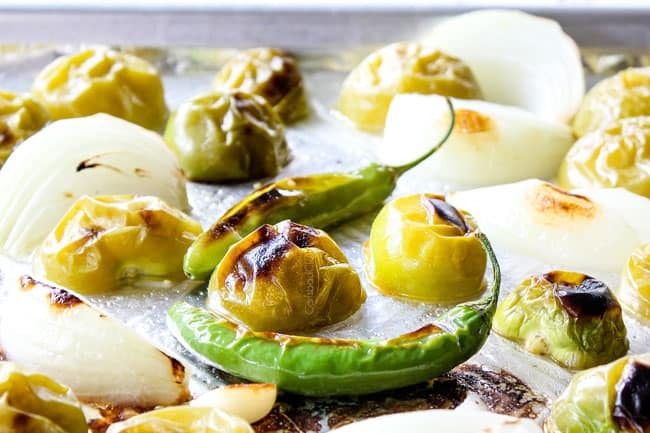 Inevitably, some tomatillos will roast faster than others, so you may need to remove some tomatillos from the oven if they are blackened before others have much color. You will also want to flip the peppers and garlic half way through so they roast evenly. Seed peppers. Once cool enough to handle, chop stem(s) off peppers and remove seeds, but don’t discard them. Save the seeds separately so you can add the desired amount later for hotter salsa. Add everything to blender. 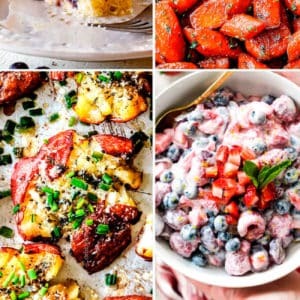 Add seeded peppers to blender along with all of the sheet pan contents including any remaining juices – we want all the good stuff! Add cilantro, lime juice, cumin, coriander and salt. Blend. Puree until salsa reaches desired consistency, scraping down the sides as needed. For a chunkier salsa, pulse and don’t puree. Customize. Taste and stir in seeds, a little at a time, for a hotter salsa. 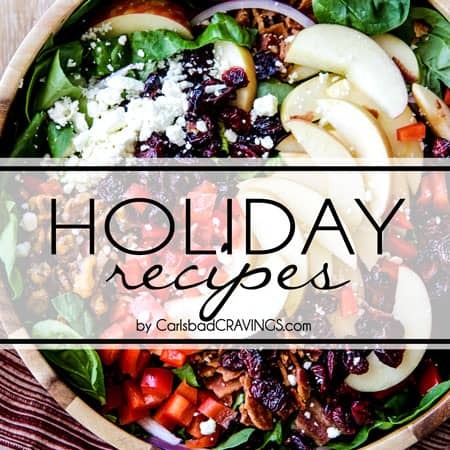 Season to taste with additional lime juice and salt if desired. Chill. Chilling the salsa is essential to develop the flavors and to thicken the salsa. Chill salsa in the refrigerator for at least 2 hours. If it has thickened too much when ready to serve, add water to reach desired consistency. Store. Store salsa in an airtight container in the refrigerator for 7-10 days. 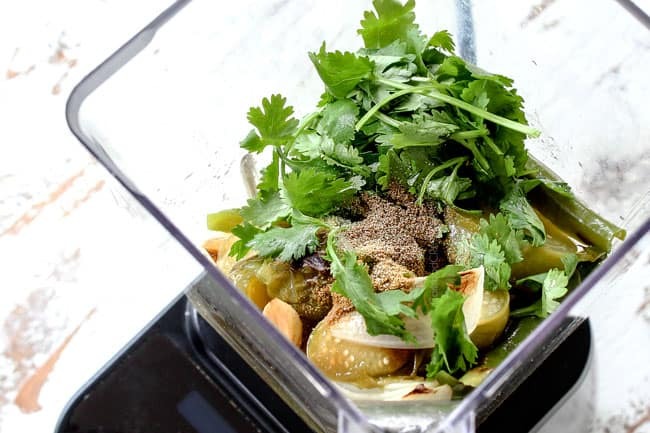 For a chunkier salsa verde, pulse to desired consistency or use a food processor instead of a blender. 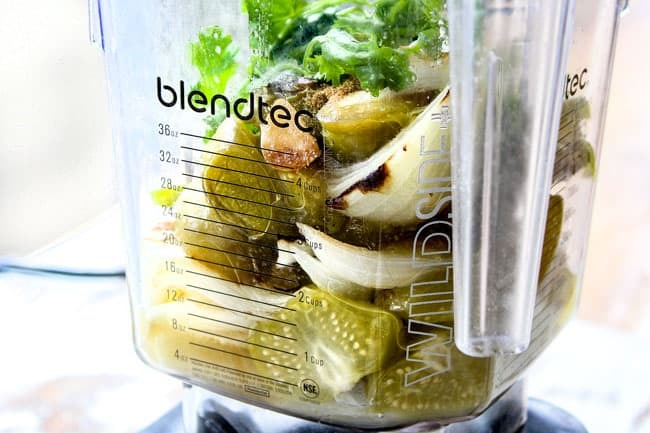 For a smoother salsa verde, chop/blend more in your blender. For a creamy salsa verde, puree on HIGH until creamy. For a thinner salsa verde, add water to reach desired consistency. For a thicker salsa verde (keep in mind it will thicken in the refrigerator), simmer on the stove until it reaches desired consistency. For a less tart salsa verde, add ½ teaspoon of sugar at a time. For a tangier salsa verde, add more lime juice. For a spicier salsa verde, add some or all of the jalapeno or serrano seeds – stirring in a little at a time until it reaches your desired heat level. For a more garlicky salsa verde, add more garlic. How Spicy is this Salsa Verde? The heat level is entirely up to you. I suggest adding less peppers then you can customize the heat by adding in some of the pepper’s seeds until it reaches your desired heat level. 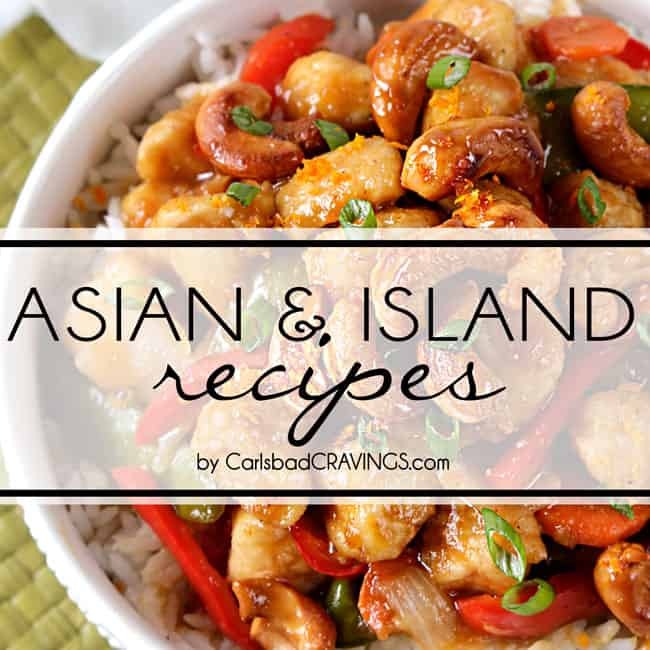 You can use serrano or jalapeno peppers in this recipe. 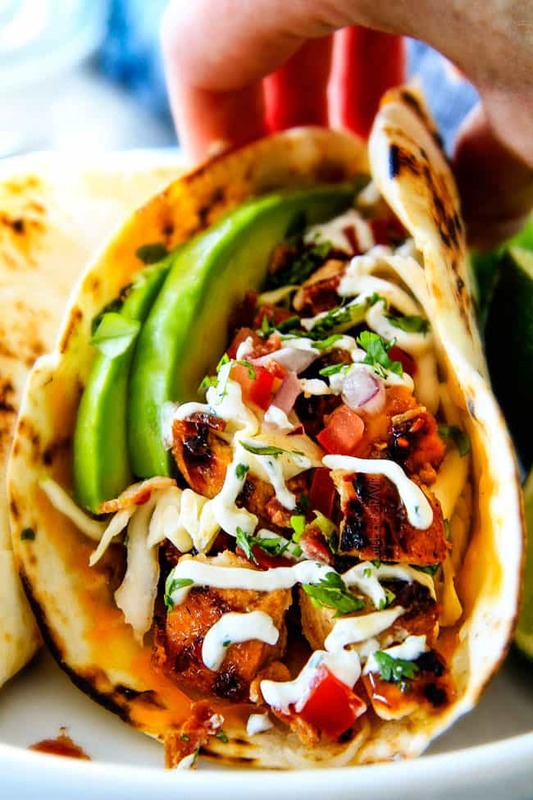 Only use serrano peppers if you know you love fiery heat! The above is a generalized calculation as even the same type of pepper can vary significantly in heat. As you can see by the serrano vs. jalapeno Scoville Heat Units, each jalapeno pepper can range anywhere from 2,500 – 8,000 SHU and a serrano pepper can vary between 10,000 – 23,000 SHU. On average, however, serrano peppers are 3 times hotter than jalapeno peppers. The two serrano peppers I happened to use, however, were crazy hot and although I like spicy, it was way too spicy for me. It is hard to subtract heat but it is easy to add, so when in doubt, use less heat (in this case, peppers). Yes! You can use as much of this roasted salsa verde as your heart desires because it is nothing more than concentrated vegetables! I love using it in places where I would use a creamy sauce like in pastas, rice, etc. because not only does it taste fabulous, it is 100% guilt free! Salsa Verde isn’t just for dipping chips. 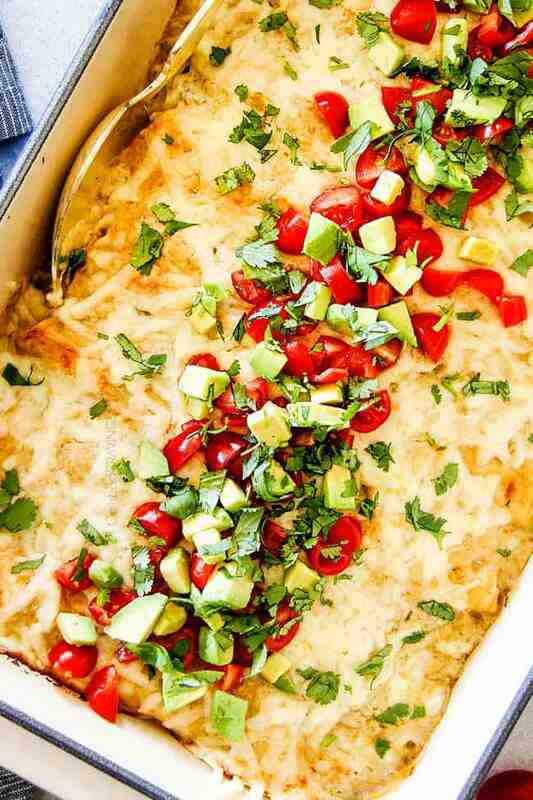 It’s fabulous in enchiladas, pastas, salad dressings, casseroles, soups, curries, dips and on and on. I also love to add it to pasta or zucchini noodles with roasted tomatoes for a light dinner (recipe coming soon) to use as a marinade with olive oil for 3 Ingredient Salsa Verde Chicken, even drizzle some on veggies before roasting them, or add to cooked rice, beans and fish. 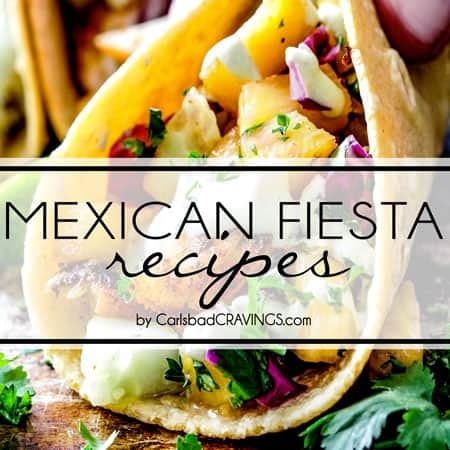 Check out just a few of my recipes you can use your Homemade Salsa Verde in! 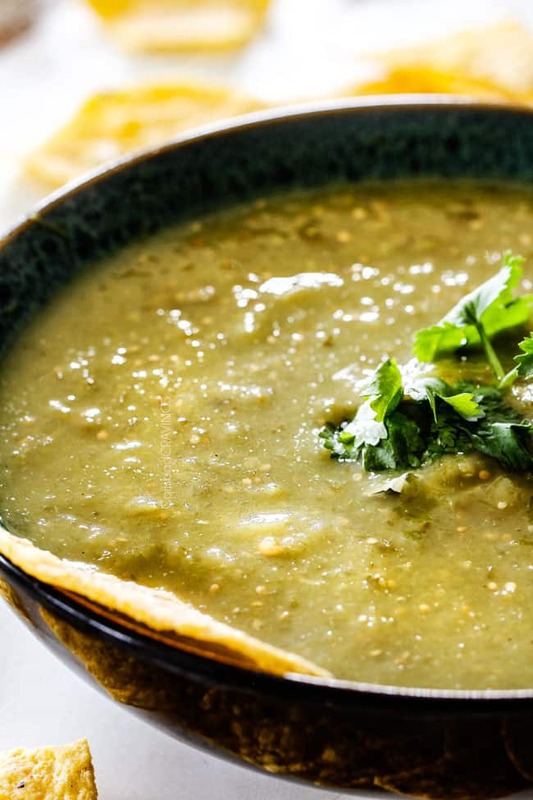 Want to try this Authentic Salsa Verde Recipe? 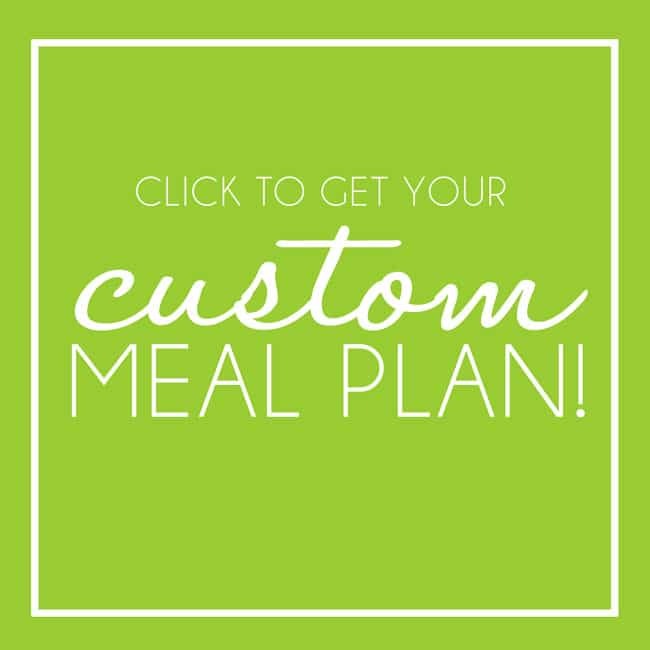 Pin it to your Mexican, Appetizer or Condiments Board to SAVE for later! 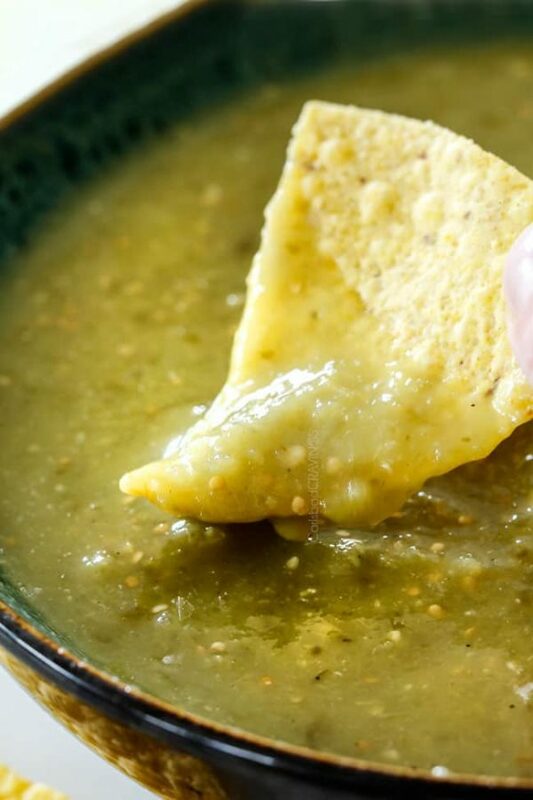 This Salsa Verde Recipe takes less than 15 minutes to make, tastes way better than your favorite restaurant or jar and makes everything it touches better! 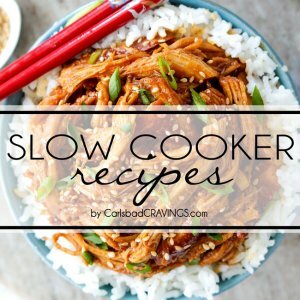 It’s quick, easy, healthy, saves beautifully and you can customize the heat and consistency. You will LOVE having this authentic salsa verde on hand! Preheat the broiler to high with a rack about 6 inches below the heat source. 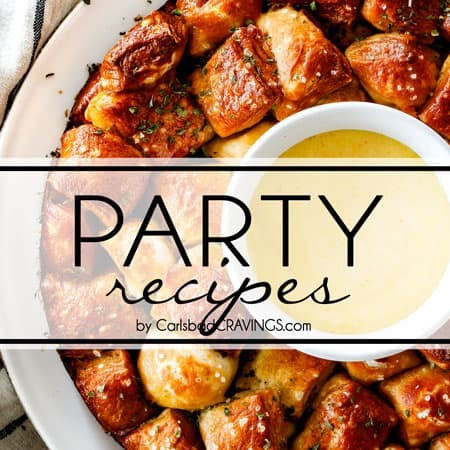 Line a rimmed baking sheet with foil. 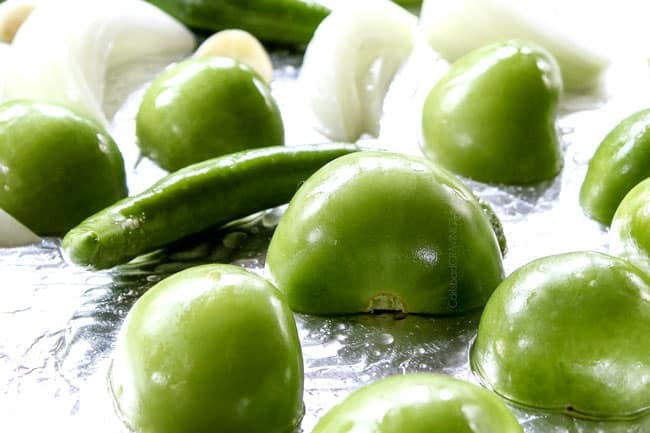 Cut the tomatillos in half and add to baking sheet along with onions, garlic and peppers. Drizzle with 1 tablespoon olive oil and toss to coat. Place the tomatillos cut side down. Broil for 5-7 minutes or until the tomatillos are charred in some spots, flipping the peppers and garlic over half way through. Remove peppers or tomatillos if they become too charred before the rest of the pan is done. Alternatively, you can char your veggies on a grill for additional smokiness. Once cool enough to handle, chop stem(s) off peppers and remove seeds (save seeds separately but don’t add to blender). Add seeded peppers to blender along with all of the sheet pan contents including any remaining juices. Add cilantro, lime juice, cumin, salt and coriander. 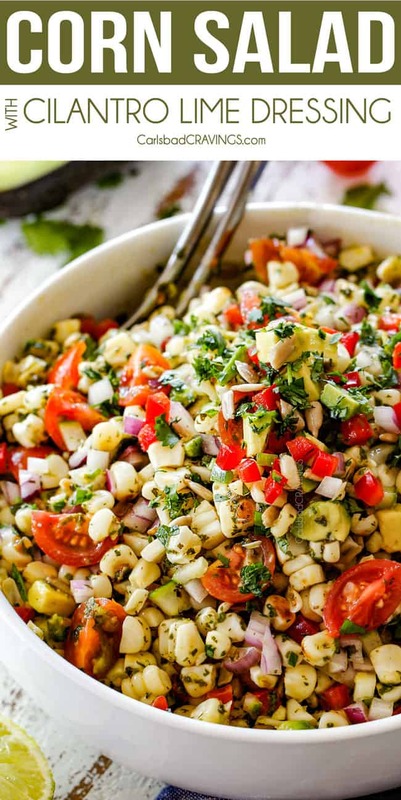 Pulse or puree until salsa reaches desired consistency, scraping down the sides as needed. Taste and stir in seeds, a little at a time, for a hotter salsa. Season to taste with additional lime juice and salt if desired. Chill salsa in the refrigerator for at least 2 hours. Salsa will thicken in the refrigerator. For a thinner salsa, stir in additional water to reach desired consistency. Store salsa in an airtight container in the refrigerator for 7-10 days. The heat level is entirely up to you. I suggest adding less peppers then you can customize the heat by adding in some of the pepper’s seeds until it reaches your desired heat level. Only use serrano peppers if you know you love fiery heat! It is hard to subtract heat but it is easy to add, so when in doubt, use less. The above is a generalized calculation as even the same type of pepper can vary significantly in heat. As you can see by the serrano vs. jalapeno Scoville Heat Units, each jalapeno pepper can rangy anywhere from 2,500 – 8,000 SHU and a serrano pepper can vary between 10,000 – 23,000 SHU. On average, however, serrano peppers are 3 times hotter than jalapeno peppers. HI Jen! 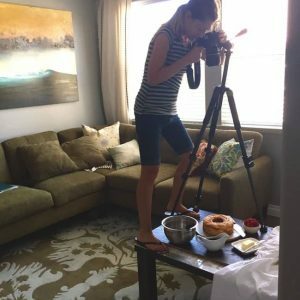 I am new to your website and all the recipes look great. We made the salsa verde today. We are growing tomatillos this year and had just enough to make the salsa. We did make one change and smoked the veggies first then put them in the broiler to brown up. The salsa tastes terrific and we plan on using it to make salsa verde honey lime chicken enchiladas. Thanks for the great recipe. Welcome Cheryl, I’m so happy you found my site! That is awesome you grow your own tomatillos – I’ve never talked to anyone who does that! I’m so happy you made the salsa verde already and loved it. Smoking the veggies sounds amazing. I hope you love the Salsa Verde Honey Lime Chicken Enchiladas as well! 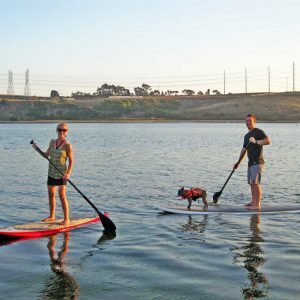 This looks great!! Love your BLOG. For salsas, I roast/char all the veggies because I like the smokier flavors and charring the chilies also tames some of the heat. For a mild version without the heat but preserving the great flavor, I use small Anaheim or poblano chile peppers in place of the spicier varieties. Thank you so much Dave! 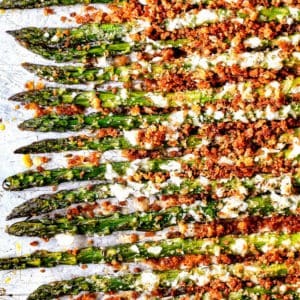 Doesn’t get better than charred veggies! Thanks so much for the suggestion of using Anaheim or poblano peppers for less spicy versions – I’ll add that to the recipe! And it’s fewer peppers not less since you can count the peppers. Less is used when the ability to count the actual number is not possible or vague. He has less money, but fewer coins. Money is a noun that doesn’t lend itself to actual counting, but coins by their nature are. Many ppl misuse these words especially since schools stopped or spend little time teaching grammar. Do you think this salsa can be stored in the freezer? 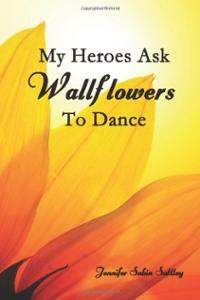 Great question – yes it can!